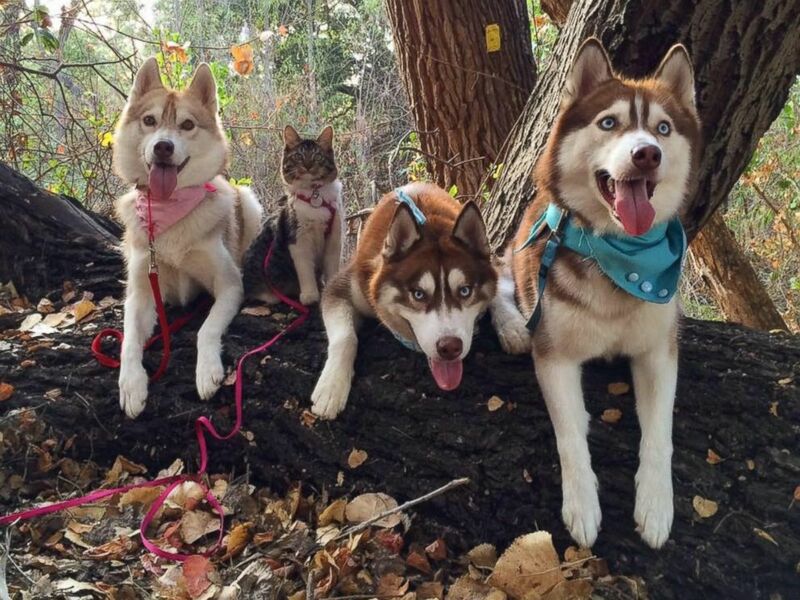 A pack of three Siberian Huskies from San Jose, California, are raising a rescued cat as one of their own, according to the pets’ owners. The three dogs — Lilo, Infinity and Miko — are “best friends” with the cat named Rosie, and they “do everything together,” including sleep, eat and play, according to Thoa Bui, one of the pets’ owners. Bui said she and her two other sisters — Thi and Tram Bui — own Lilo and Infinity and Rosie, while their cousins — who live down the street from them — own Miko. The kitten eventually started trying to “suckle” on Lilo, which was the beginning of their “mother-daughter relationship,” Bui said. She added Rosie looked to Lilo for guidance, so the young cat started “mimicking everything” the dog did. The four pets eat together, drink from the same bowls, play together, go on walks together and even nap together, Bui said. Bui added that she and her sisters love taking photos and videos of the photogenic pack, who prove love knows no bounds.